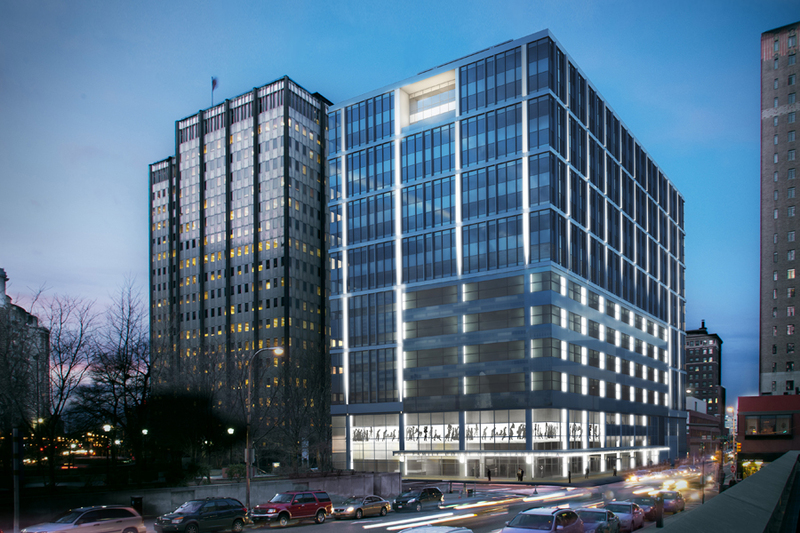 Metropolitan Acoustics was responsible for acoustical and A/V consulting for the new 14-story, $200 million Family Court Building in the heart of Center City Philadelphia. Our scope included recommendations for wall and floor/ceiling constructions to provide appropriate isolation between spaces throughout the building. The critical spaces such as courtrooms, jury deliberation rooms, and judge’s chambers were of particular importance. Additionally, we performed a room acoustics analysis for a variety of spaces including courtrooms, conference rooms, open office areas, judge’s chambers, waiting rooms, and the main lobby which is both the main public entrance to the building and an area used for after-hours and visitation events. Our room acoustics recommendations focused on optimizing speech intelligibility in offices and courtrooms and preventing sound from building to excessive levels in the large gathering spaces. Our analysis of mechanical system noise considered courtrooms, judge’s chambers, open and closed office areas, conference rooms, waiting areas, and the main lobby. We looked at a variety of sound transmission paths including ductborne sound, structure-borne sound, and radiated sound from mechanical equipment transmitted through partitions into adjacent spaces. Recommendations were provided to reduce the sound levels in all critical spaces to appropriate levels. Additionally, we provided recommendations to control sound levels from mechanical equipment transmitted outdoors to the surrounding properties. Our A/V design included 29 courtrooms, video-enabled distance testimony spaces, two video-conference enabled judicial conference rooms, a three-way divisible conference center, and training room, and projection and sound reinforcement systems for the main lobby. The courtrooms contain a variety of audio and video reinforcement, networked audio recording, and video-conferencing systems all managed through a single touch screen display. Additionally, the lobbies and court waiting areas will include zoned paging systems, digital signage displays, and new television feeds. All of the audio and video content will be routed throughout the facility on a combination of point-to-point fiber and standardized Ethernet distribution.